We’re approaching the Arctic outbreak and light snow possibilities that I’ve been discussing in the past few weeks. Remnants of Typhoon Nuri went on to become the strongest Bering Sea storm on record. That energy pushed up into the Alaskan polar regions of the northern hemisphere and in return, plunged arctic air mass southward into the central and eastern US. The frontal boundary of this colder air mass is approaching the east coast and will be through by early tomorrow morning. The next possibility is more interesting to me. This should occur this coming Monday-Tuesday. A stronger and better-defined low pressure system looks to form in the Gulf of Mexico and ride up the east coast and throw a decent amount of moisture inland. Guidance has been consistent on timing and precipitation amounts. The wildcard is where the snow/rain line will set up. I could see this being snow for NWNJ and cold rain for everyone else should lower level temperatures moderate too quickly. On the contrary, if the arctic boundary holds stubborn (like it did many times last year), then the snow/rain line could be further SE towards I-95. Regardless, I think coastal and SENJ see all rain with this one. The battleground between snow and rain will likely be inland. 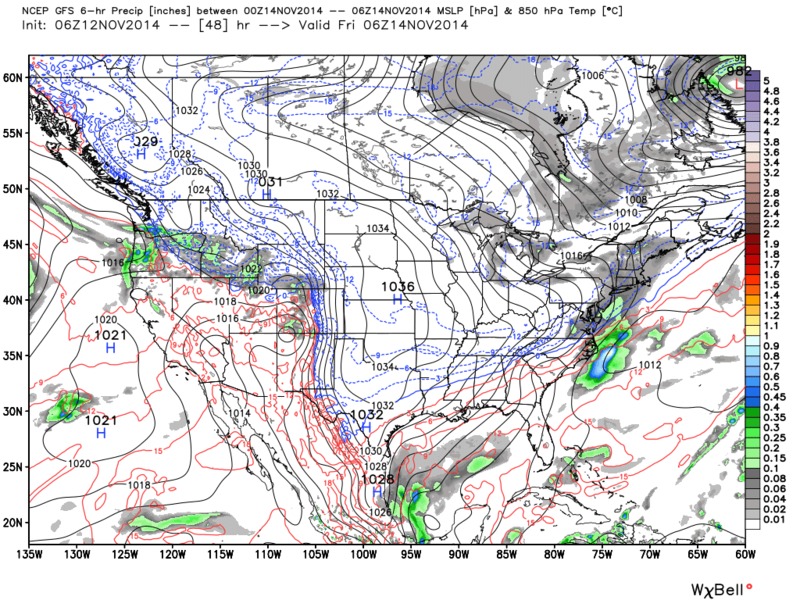 Here’s same upgraded GFS model/parameters as above but for 2PM through 7PM on Monday.